In 2009, Vornado rolled out its Energy Information Portal (EIP). The EIP is a web-based tool through which submetered tenants will have access to their electricity bill, and their energy usage profiles and data. We believe this tool can help tenants identify and change wasteful energy practices within tenant spaces, lower electricity costs and become more energy efficient. Between 60-80% of the energy used in our office buildings is consumed by tenants within their spaces. In developing its energy and sustainability program, Vornado has recognized the opportunity to utilize its existing installed base of approximately 2,500 meters by modifying and upgrading the legacy systems to an "interval data" system and creating the EIP. This upgraded system and the EIP are designed to help tenants, the users of energy, to better understand their energy usage profile and to hopefully induce a "Prius effect" among tenants to move toward energy efficiency and a decrease in energy usage. Additional benefits can result through increased participation in curtailment and demand side management programs and enhance job creation in the energy services industry. As the tenant consumption decreases it will produce cascading benefits by reducing the load on the main building chillers and HVAC systems by virtue of not having to remove the heat that is associated with the larger tenant energy use. The Energy Information Portal (EIP) is a web-based tool through which submetered tenants have access to their utility bills, energy usage profiles and energy interval data. This tool can help tenants identify and improve energy practices within tenant spaces, lower electricity costs and become more energy efficient. Password: Contact Property Management or Source One at support@s1inc.com. Update your user profile and contact information by selecting “My Profile”, which will also allow you to register to receive copies of you bills via email each month. To see the submeter bills, select the tenant billing module, and then click on tenant invoices. You can change the billing parameters by sorting the year and/or month. To review a summary of each month's usage and costs, change the search parameters to the utility, year and month, you are researching and refresh the query. Click on the bill period for the current and previous year data. This will provide a convenient view of your monthly expense comparisons. The metering module will enable you to view energy usage profile & interval data in 15 minute increments. The “Customer” field will display your company name, the “Meter Point” displays all the meters associated with your premises, the “From” and “To” fields allow you to select the time periods in which you want to view your data. If you have multiple meters, select “All” and then click on “Refresh”. 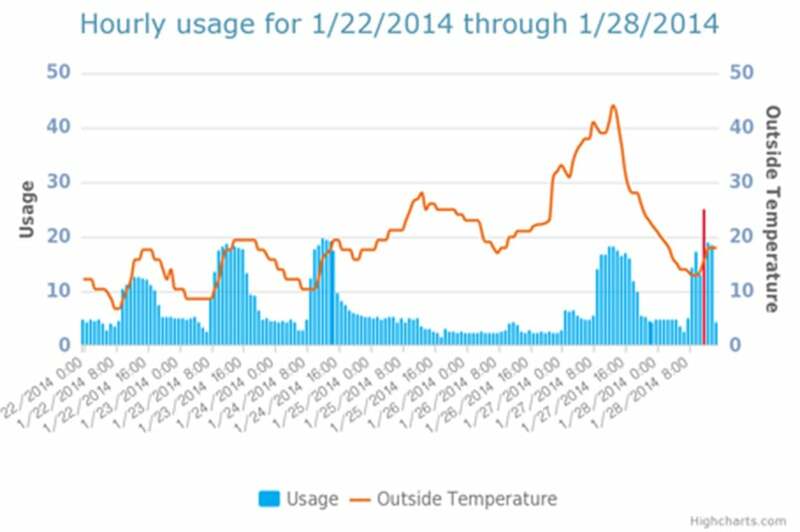 A graph will display the most recent seven (7) days hourly increments of the total consumption in your premises. A checkbox next to the meters will allow you to individually select any one meter to view the data. If you need help, an energy consultant can help you to determine what equipment is using energy after hours. This will help you to identify any wasteful practices. The “Load Factor” is calculated by multiplying the “Peak Demand” by the number of hours in the period and dividing the total into the actual Kilowatt-hours in the same period (expressed as a percentage).